The SL81e is a highly developed versatile tree shaker that is tractor mounted and can work in both bush or standard orchards. It mounts directly onto the tractor’s three point linkage. It is fast and powerful yet gentle on the trees. It swings sideways from the tractor to grip trees in rows up to 7.3 metres (24 feet) wide. The shaker head can be lifted or lowered to that the tree can be gripped anywhere on the trunk. The shaker has two eccentric weights that combine to create a multidirectional shake that gives excellent fruit removal, without damaging the tree trunk of the centre leader of the tree. The power of the shake can be adjusted by changing the weight set. Large jaw rubbers provide a well-cushioned grip of the tree’s trunk. There are lubricated flaps over the jaw rubbers to eliminate tree bark shear. 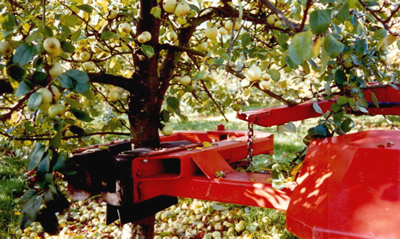 The machine has a low profile and a shaped cover which enables it to slide under laden low-hanging branches on bush trees without damaging them. The side swing action enables the machine to work in any row width and the tractor to be driven in a straight line beside the row to be shaken without any need to change gear or reverse. The shaking head is supported on a self-centring mechanism. This makes the machine easier and faster to drive. Experienced operators can shake over 360 trees per hour with the SL81e. The SL81e shaker is hydraulically powered from the tractor PTO. It has its own integral hydraulic tank, and hydraulic control valve. The controls are all electric and twin joysticks in the cab control all the functions of the shaker.